Spring is coming to Friends House Retirement Community. Daffodils are pushing their way up to the blue skies and sunshine. Our Garden is beginning to come alive as our residents tend to its care. Soon part of our old building we call “E” wing will be torn down. A brand new building “Homes on Quaker Lane” will be built on the footprint of E wing. This new affordable living building will be home to 80 residents. Friends House has been planning for years this major renovation and growth. 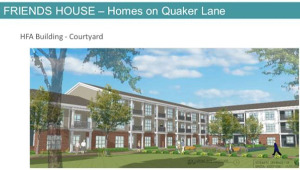 The plans are beginning to come to life—construction of the “Homes on Quaker Lane” begins this spring and is expected to be complete by spring of next year (2020). Our residents are also looking forward to their new homes. Most of our residents will be in larger spaces. Everyone is looking forward to a new library, thrift store, and dining room. For more information about our affordable housing, lodges and cottages, contact Barbara Brubeck, Residential Living Director at 301-804-4213 or bbrubeck@friendshouse.com. Also take a look at our website: www.friendshouse.com. In the fall of 2012 Friends House Retirement Community Nursing Facility-Stabler Hall received a five star rating from the Federal Government. This started a period of celebration recognizing that Friends House has been in business for 45 years. The celebration began on Sunday October 28th with an Open House showcasing activities important in the life of Friends House residents. This included the chorus, flower arranging, art activities and a bridge game, as well as guided tours of the facility. The official 45th Anniversary Celebration was on Thursday evening, November 1st. The program included remarks by Executive Director Kevin Harrington and Board Members John Smallwood and Mary Satterfield. Three residents, Dottie Hett, Betty Hutchinson, and Ralph Blankfield spoke about significant events in their life at Friends House. Following this was an exceptional musical performance by the Sherwood High School Chamber Singers. Topping off the evening everyone was treated to cake and punch. The next day, Friday November 2nd, the celebration continued with an International Fashion Show. Organized around the wonderful staff, who have come from many parts of the world, they showed off the wide variety and beautiful national dresses. In-between the International contributions, the Elephant Shop thrift store volunteer staff modeled some of their favorite items from the shop. The event was highlighted with the inclusion of many nursing home residents in the audience appreciating their staff helpers in a new light. We look forward to a future where the spirit of Friends House that includes love, respect, and support caries on for another 45years. Friends House in Sandy Spring, Maryland is the only retirement community in Baltimore Yearly Meeting whose board is approved at BYM Annual Session. For some of us this represents a strong bond of the principals and procedures between BYM and Friends House. Many residents recognize living at Friends House as making the most of life in a supportive residential Community. As in other Friends organizations, there are many committees and volunteer opportunities under the organization of the Residents Association to provide ways to participate in the community and support individual views and personal skills. In this way Friends House often provides services on a volunteer basis that other facilities have paid staff to cover. One such service is the “Free Rides” program which provides transportation to local appointments for individuals no longer able to drive. We also have an active community garden and organize our own programs of music, speakers, and films as well as trips to cultural and educational events in the Washington, DC area. Other services available for residents as needed are a pharmacist, beautician, podiatrist, audiologist, as well as exercise programs, physical therapy, and housekeeping assistance. 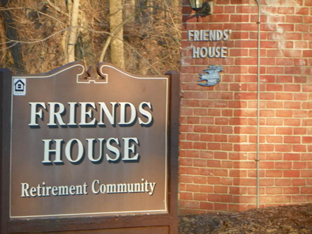 Friends House was originally planned as a facility supported by the HUD program to provide a low cost retirement community for Quakers and others. It has grown to include about 150 residents with about 50% Quakers. There are some interesting relationships: a mother and daughter, two college roommates, and two cousins. It is located adjacent to the BYM office and includes independent living garden apartments, independent living cottages, assisted care, skilled nursing, and rehabilitation divisions. Recently Friends House was licensed as a low-level Continuing Care Retirement Community. If you think this might be a place for you, and you would like to have more information, contact Carolee Harvey at 301-924-5100.